Are you considering stepping your bike riding up to the next level? If so, a bike computer will do the trick. Not only does it provide feedback for distance, speed, and calories, but some will even track cadence and your heart rate. And here’s the best part: you can pick one up at a fair price. Plus, they are built for adverse weather condition. So now you don’t have to risk damaging your smartphone if you were considering using one as an alternative. If you are ready to begin the process of buying a bike computer, this guide will help. Keep reading to learn the benefits of riding with a bike computer. You will also find an explanation on how bike computers work, a guide on how to choose the best one for you, and a list of the best 8 bike computers in 2018. So, let’s begin starting with the benefits of riding with a bike computer. There are many benefits when it comes to using a bike computer. That holds especially true when using one instead of your smartphone. Read on for five of the top benefits you will experience. Benefit #1- Track Speed, Distance, and Calories Burned. Whether you are riding for fitness or training for a race, a bike computer is handy. Not only do you have a clock available in to view at all times, but it tracks your speed and distance as well. By having access to this data, you will improve your speed and distance with each ride. Bike computers are convenient if you ride the same course also. You can time yourself on certain sections of your ride and try to do them faster each time. For fitness riders, you now can monitor how many calories you burn when riding. This makes achieving your weight loss goals much more manageable. Different bike computers come with various features to help improve your cycling. We will go over these features in more detail later in this guide, but here are some examples: current speed, average speed, calorie counter, and heart rate monitor. I know, these features can sure transform your bike riding for the better. They are all designed to help monitor your progress and show you where your opportunity for improvement lies. One of the greatest benefits of using a bike computer is how easy you can access real-time data. They connect to your bike which makes data viewable while riding. And changing screens for more data is done by a simple click of the button or swipe of the screen. Now, access to your riding data is easier than ever. Some riders consider using their smartphone as a bike computer, but if you do so, you may run into a few problems. Sure, you save a few extra bucks up front, but it may come back to bite you later. For example, riding with a smartphone will not only drain your battery, but it can be damaged by bad weather. Simply put, they are not as durable as bike computers. Not to mention they aren’t as convenient. Viewing real-time metrics is way easier on a bike computer compared to a smartphone. Ride with no worry about damaging your smartphone if you decide to use a bike computer instead. This will make your ride much more enjoyable, and you can focus on improving your riding, no matter how messy things get. Mostly all bike computers will come with an odometer. Just like a car, this will track how many miles you ride. As you may already know, bikes need to be serviced. This prevents excessive wear and tear which leads to a premature lifespan. With a bike computer, you can use the odometer and perform servicing when needed. So, now that you know the benefits of using a bike computer let’s jump into understanding how a bike computer works. How Does A Bike Computer Work? To know how a bike computer works, you need to understand how it delivers information. The process is done in two way. First through sensors and second through data transmission. Here’s another way to explain it: you must understand how your data is captured and how that data becomes viewable. First, there are two primary types of bike computer sensors: Magnetic & GPS. A magnetic bike computer uses, yes you guessed it, magnets. Here’s how it works: a magnet attaches to the wheel spoke while a senors sits on the front fork. With both pieces in place, it can monitor the wheel as it rotates past the sensor. For some models, a sensor is attached on the rear while, and the magnet connects to the crank. 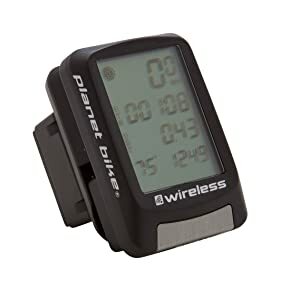 This will provide data on your cadence if its an available option on your computer. The magnetic style sensor is typically lower in price, and its battery lasts much longer. The downside is there is no GPS included. That brings us to our next type of sensor–GPS. To capture your bike riding data, it uses satellites just like the GPS system for driving your car. The only difference is the computer uses a satellite receiver which calculates your ride data. It’s done so by the conversion of the GPS signals it picks up. Overall, GPS signals are convenient because they don’t require any sensors, you just clip it to your bike and go. They also come with customized screens and hold much more data then magnet types. However, GPS types typically cost more money and similar to a smartphone, they need constant recharging. For magnetic sensors, there are wired and wireless styles. The wired magnetic sensors use a cord to transmit the signal to its display screen. Whereas the wireless magnetic sensor uses a signal transmitter. The GPS sensor is wireless also. Overall the wired units are less money, lightweight, and more straightforward to learn. On the other hand, wireless units are much more convenient, provide more data, but cost more money overall. So, now that you understand how bike computers work, it’s time to learn how to choose the best bike computer for you. As you begin looking through the various types of bike computers, it’s easy to get overwhelmed. There are many different models and features to choose from. But with this guide, you will be on the right path to finding the best bike computer for you and your style of riding. During your search you will find basic bike computers that simply track metrics like speed, distance, and trip time. However, as you get away from the basic models, you will discover a new world of features and functionality. Many wireless options track far beyond basic data. Some even monitor your heart rate and VO2 max. So, find a comfortable balance between price and the type of features desire. To help, below I will list some features that come with different bike computers. You can then pick the features you desire and look for them in the reviewed bike computers below. But remember, the more features and better convenience, the more money your bike computer will cost. So, find a set of features and a price point that works best for your riding and budget. For example, a competitive bike rider versus a fitness enthusiast will require different features. So, read on as I list the most popular features and provide a brief explanation of each. Basic Tracking Features – All bike computers will have basic metrics, but some will have more advanced data. The most popular trackable data available is max speed, current speed, average speed, trip distance, odometer, clock, calorie tracker, elapsed time, and heart rate monitor. So, pick what’s most important to you and make sure the bike computer you choose tracks those metrics. Battery Life – How important is battery life to you? If long battery life is necessary, then the magnetic type of unit is best. No, it doesn’t come with as many features, but its battery life is extended. That’s because it uses watch batteries which allows it to last for years without replacement. That’s versus the GPS style, which like your smartphone requires continuous charging. The average GPS bike computer will last 20 hours before losing a charge. Usable on Different Bikes – Remember, a magnetic sensor style bike computer uses sensors that attach to your bike. In this case, transferring your bike computer from one bike to another is not quickly done. That’s in comparison to a GPS style bike computer where it can be moved from bike to bike and still track your data. Data Transfer System – Speaking of data, how do you want it transferred? If you’re going to transfer it to a website or on your social media page, then a GPS bike computer is the way to go. It makes posting your rides easy and customizable to all your social media pages. Screen Light – If you plan on riding at night, then make sure your bike computer comes with a built-in backlight. You will thank yourself later. It makes the screen much better to see when the sun goes down. Screen Readability – It’s critical that your bike computer has a display screen with digits your can see. If you want large simple to read data with not a whole lot of functionality, then try the magnetic type. But if you are looking for multiple screens, custom templates, and many viewable features, then the GPS style is best for you. Now that you know what features to consider let’s get into the fun stuff. Let’s pick out the best bike computer for you. Read on as I list the 8 best bike computers in 2018. 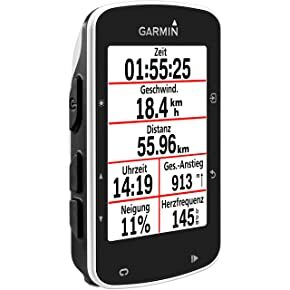 If you are looking for a high-quality GPS bike computer, then you found it with the Garmin Edge 520. As you may know already, Garmin is one of the best, if not THE best, when it comes to GPS active devices. If you run, you may already have a Garmin watch. Besides its highly accurate GPS capabilities, it has a convenient display screen. You can choose from different templates that allow you to see up to 6 fields displayed at once. So now you can keep an eye on all your data while riding like heart rate and average speed. It even offers in-ride challenges that take place live on Strava. What makes this bike computer most unique is its metric tracking capabilities. 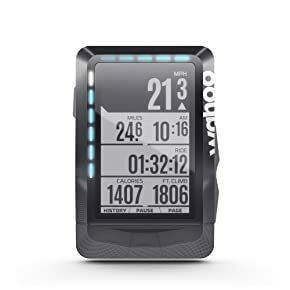 If you are using its power and heart rate function, then you can track your VO2 max and recovery time. Remember–bike computers are all about their features. This bike computer comes with smart notifications, live tracking, weather forecasting, automatic uploads, and you can even send and receive courses. Its users love how easy it is to share their rides with friends and followers on social media. Excellent battery life and water rating for long rides in any type of weather. Simple to use functions with a display screen that provides superior readability. Accurate GPS system with clear mapping and turning for a safer and smoother ride. Advanced data tracking for your heart rate and VO2 max. Syncs with Strava and it’s easy to post rides on social media. It’s made by Garmin, so it’s reliable. The unit is on the smaller side but has a large screen. 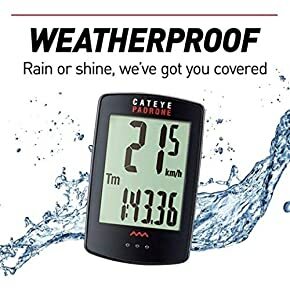 If you are looking for a simple to use bike computer that’s easy to read, then check out the CatEye Padrone. No, it’s not a GPS unit, but you still get all the best stats like average speed, max speed, current speed, trip distance, total distance, odometer, clock, and elapsed time. Plus, this bike computer is easy to read. That’s because the screen is huge, and the digits are big and bold. And when you want to switch screens for other data, no pushing little buttons to do so. You can imagine how frustrating it is to take your eyes off the path ahead trying to navigate between screens. No, with this bike computer all you need to do is press the base and the screen, and it will switch to the next page. Its users praise this bike computer for how easy it is to set up. Overall, its simple to use and comes with a screen that’s easy to read. Auto-pause function stops tracking when you stop riding, ultimately preserving battery life and providing accurate data. Made durable and reliable for longevity. Multiple color option, unlike most magnetic type bike computers. An easy-to-read display offers a safer riding experience. Huge digits on screen make it easier to view. Simple to set-up and operate which well…is a whole lot less stressful. Does not transfer data…sorry social media followers. Pressing the base can happen by accident. 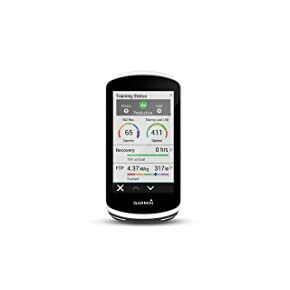 The Garmin Edge 1030 is a GPS type bike computer that not only comes with a comprehensive navigation system but has an excellent screen size to help follow that navigation. Sitting at an amazing 3.5”, this device is not only simple to read, but it’s easy to set up as well. Sometimes a bike computer is hard to see at night. But not with this one. You’ll love its readability during the day, and at night it utilizes a powerful backlight. And here’s the best part: the extra light doesn’t do much damage to its battery life. In fact, many users say the battery life is superior to all other bike computers they’ve used in the past. What I think makes this Garmin different from other bike computers is how it uploads multiple routes. It holds billions of miles of on- and off-road data from Garmin Connect, Strava, and Training Peaks. And that right there will be worth the extra money. Yes, this bike computer is not cheap, but if you are a serious rider, then you will get everything you need in this one unit. It even tracks your heart rate and VO2 max. Overall, a pricey unit with all the functions and features you could ever need. Plus, it’s made by Garmin, a company you can trust. A large display screen for excellent readability. Preloaded maps for riding new routes by a simple press of the button. 20 hours of battery life when using GPS Mode even when using the backlight. Popularity routing to ride the most common routes. Messaging between rider to rider with compatible units. Advanced training analysis for peak performance. If you are looking for a bike computer with a lot of data but without all the bells and whistles, then the Planet Bike Protege 9.0 is your next bike computer. It’s a 9-function wireless bike computer. So, you get metrics like speed, time, and distance but at a low-cost and without the fuss of a connection cord. It also does an excellent job of simplifying its display screen. In large digits, you get the main metrics: time, speed, and distance. They are always displayed so you won’t have to worry about losing this data from your view. However, the bottom segment of the screen can be changed. For example, you can switch your odometer to average speed and switch it back when your ride is over. Overall, its users love this unit for getting their basic needs at an excellent price. Wireless so no cord to get in the way or worry about losing. Easy-to-read screen for viewable data while riding. Made durable but still lightweight and quick to handle. No color options: only black. Minimal features include but not bad for its cost. 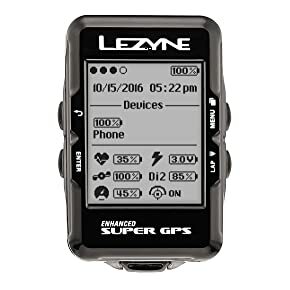 The Lezyne Enhanced Super GPS bike computer is an excellent buy all around. 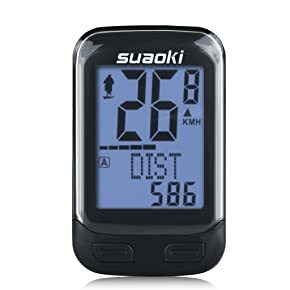 You get the GPS functionality of an expensive bike computer, but with fewer features, you can have this guidance at an affordable price. Remember, buying a bike computer is all about the balance between price and the features you desire. Well, at a decent price, this device has a smartphone integration for turn-by-turn navigation. You also get all the basic data seen in other bike computers and its compatible with Bluetooth Smart as well as ANT+ sensors. Its users praise this bike computer for its data screen options. Superior GPS unit in relation to its cost. Easy-to-read screen for increased readability. Accurate GPS system for convenient riding. Not as many features available compared to other GPS computers. The Wahoo Element Bolt is a wireless bike computer that not only tracks your basic riding data, but it comes with an automatic function for uploading routes. This is achieved through its compatibility with Wi-Fi and Bluetooth technology. Although it’s a black and white screen with buttons instead of a touchscreen, its still super easy to read and its tracking abilities are incredibly accurate. Whether you want to track your heart rate, distance, speed, or need real-time navigation turn-by-turn, this bike computer will get the job done. Its users love how it syncs with Strava and provides accurate GPS readings. Customer aerodynamic design with an integrated computer+mount. A custom display provides the data you want to see when you want to see it. Turn-by-turn navigation for a convenient ride. Syncs with Strava app…everyone loves using the Strava app. Made durable and lightweight for confident handling. You could bounce this thing off a wall. No manual brightness adjustments are available. 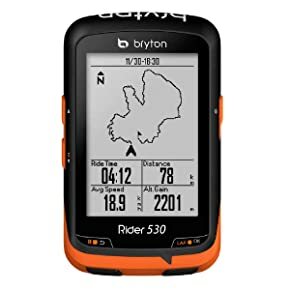 The Bryton Rider 530 is designed for riders who are looking to improve performance. Beginner riders to pro cyclists who are looking for a way to advance will appreciate this bike computer’s display screen. That’s because it packs a total of 12 cycling metrics per page! Talk about a bike computer to advance your training. It also pairs with its Bryton app which allows you to share and download new routes wherever you are riding. And when you are done riding, you will receive a full graphical summary of your data. This data will allow you to see your strengths and help you find places in your training that need improvement. Its users praise this device for how much progress they’ve made since implementing all the available data into their training plan. Excellent price for how much value it provides. Incredible battery life of up to 30 hours. Wireless data sync for convenient sharing. Backlight comes on automatically when dark. Heart rate sensors for bpm monitoring. Bryton app allows you to share your rides on social media easily. 12 sets of data displayed per page…data, data, and more data! Digits too small for some riders. Street name following not as convenient as other GPS tracking methods. The SUAOKI transmission Bike Cycling Computer is all about speed. On its big display screen, you will find your current speed tracking in big and bold digits. You can also track max speeds as well as average speed. One of its best features is how well it tracks your cadence. Its sensors count your RPM’s from the crank arm. The setup is easy too. After installing the batteries, you reset and pair it, install the bracket, mount the sensor, mount the magnet, and clip the computer into the bracket. After a spin of the wheel, you are ready to ride. It’s users praise this unit with how well the sensors work. Many users say it works perfectly. Current speed and cadence used to improve speed. Lowest cost unit on the list. Low-cost, so you don’t have to worry about breaking it and losing money. So, there you have it, everything you need to know about buying the best bike computer for you. When it comes to bike riding, we all do ride for different reasons. Some to stay active, some to compete, and some because well, we just love to ride. Fortunately, there is a bike computer available for all styles of riding. With this guide, you now have the information not only to understand how a bike computer works, but you know how to choose the best one for your style of riding. Now all you need to do is pick one out, ship it out, and use it to become a better rider, the rider you know you can be.